Occupying four permanent galleries in the Museum's new gallery space, the Huntington Building, this exhibition chronicles the history of African American art and features works of art from the earliest African American painter whose work is extant (Joshua Johnson) to works by such contemporary artists as John Biggers, Elizabeth Catlett, and Jacob Lawrence. The Museum is the only institution in the nation to have such an exhibition on permanent display. See examples from the collection! 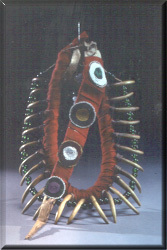 March 28, 1999, the Hampton University Museum unveiled its historic collection of American Indian art and artifacts in a new, permanent installation, Enduring Legacy: Native Peoples, Native Arts at Hampton. Mary Lou Hultgren, the museum's former curator of collections, stated, "Enduring Legacy offers a wonderful opportunity to share with the public objects that have not been exhibited for many years." "The Native lives represented in Hampton's historic American Indian program are a testament to the beauty, strength, and tenacity of the cultures to which they belong," noted Dr. Paulette Molin (Minnesota Chippewa), co-curator of the exhibition. "Although a numerical minority, the students transcended their small numbers and the brief, 45-year time span of the program to extend an influence that reverberates today. For Native Americans, the multifaceted impact of the boarding school era, of which Hampton's program is a part, is complex and generational. These stories are critical to our understanding of an important chapter in the history of this country." Hampton University Museum's African Collection - the finest at any African American museum or educational institution in the United States-is once more on view in The Art of Africa: Power, Beauty, Community. This dazzling exhibition of over 200 artifacts from across sub-Saharan Africa showcases the strength of Hampton's collection. 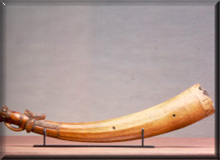 The Art of Africa includes not only objects from the Museum's historic collections, but also a number of pieces that the Museum has acquired since the 1960's. Approximately half of the objects on display have never before been exhibited at Hampton!